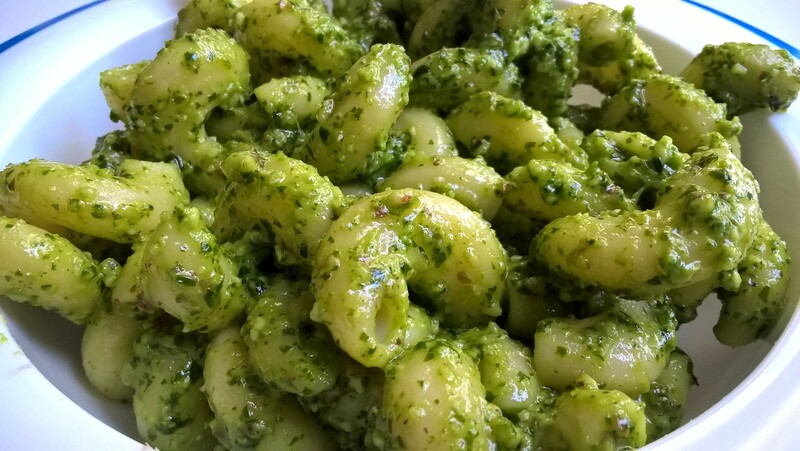 Lately when I make pesto I use a 5 oz box of arugula, 1 cup of walnuts or some other nut (although different nuts play out differently and you may need to use less or more, probably less), and at least 4 cloves of garlic. I have to coax the entire box of arugula through my mini food processor but by adding a little bit of oil at a time and being patient, I can do it. I’m into the avocado oil lately. It seems so far like the best choice. Works great. First put the garlic through the food processor, then add the nuts and process, then the arugula in batches along with enough oil to get the whole box of it through the processor. Add salt and pepper. This entry was posted in Edibles & Mixtures. Bookmark the permalink.